The guys pause for a group picture before beginning an install. This picture was taken at the 1997 Championships of the Americas in Buenos Aires, Argentina. Eddy Esworthy was a member of the USA Shooting Team from 1990 to 1998. He participated in International Rapid Fire Pistol as well as Air Pistol. During these years he traveled all over the world representing the USA in various International competitions and World Cups. Various International medals were won including Team Gold, Silver, and Bronze medals as well as an Individual Bronze at the 1993 World Cup USA. Visiting ranges from all over the world while on the team gave Eddy knowledge and ideas as to how ranges can be built. Starting the company in 1991 while in college, Eddy has kept the business relatively small and dedicated to quality products that just work for over 20 years. After taking a break from competition shooting since 1998, in 2007 Eddy became involved in local IDPA competitions. 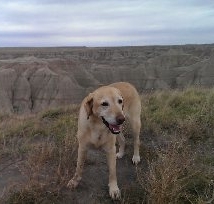 Cosmo is Chief Coordinator for Team & Customer Morale at Targetworx. It is an important duty, especially during long weeks of installations when the team is far from home. Cosmo takes his task seriously, enthusiastically wagging his tail wherever he is most needed. As the oldest member of the team - in relative dog-to-people years - he is the only one who is allowed to occasionally sleep on the job. Lance Smith has been involved in shooting all his life, including enjoying Rifle, Pistol, Shotgun in recreational and competitive arenas. 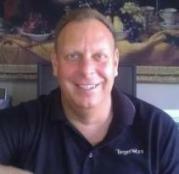 Lance has worked on the Targetworx team during nearly every range job the company has done. While being good with his hands, he's also great with customers. He is a real people person. If we do a job for you, I'm sure you will spend some time talking to him. Ed Esworthy is Eddy Esworthy's father and has owned and operated Esworthy Painting since 1970. Ed has been an avid hunter and shooter all of his life. Ed and his crew of painters are responsible for all of Targetworx's painting needs. Tim Conrad has been the designer of all of the electronic systems for Targetworx since connecting with owner Eddy Esworthy in 1989. Tim has served as Technical Director for the NCAA Rifle Championships 2005-2010, provided technical support for Megalink Electronic target systems through 2010, served as Principal Engineer in the engineering department of the U.S. Olympic Committee Sport Science division from 1992 through 2002, was a member of the Shooting Sports Research Council, and the Chief Engineer at Chicago Laser Systems, a machine tool company, prior to his move to Colorado in 1988. He has designed displays and training devices for many sports, including Shooting, Swimming, Luge, Bobsled, and Speed Skating. Tim has been a competitor in smallbore rifle for 20 years, earning one regional and two state championships. 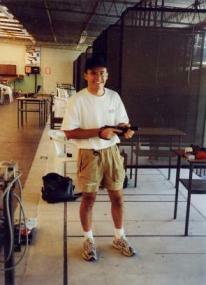 Tim held Advanced International Coaching certification in smallbore rifle for 15 years. Across the country, Greg is known as one of the leading experts in building and successfully operating an indoor shooting range. Greg is the former manager of the NRA Headquarters Range - one of the busiest indoor shooting ranges in the country. While at the NRA, Greg worked closely with the Range Development Department and was involved in range consultation all over the United States. During his 15 year tenure at the NRA, Greg was awarded a total of six outstanding achievement awards including the prestigious Executive Vice Presidents Award - the highest honor given to an NRA employee. He has also worked as subject matter expert for a variety of companies and television shows, including some of Hollywood’s most well-known production companies such as Jerry Bruckheimer Films. Greg has been a competitive shooter for over 25 years. He is an IPSC Grand Master and IDPA Multi Gun Master. From 1997-2000 he was ranked in the top twenty of open Grand Masters in the world. Greg has multiple law enforcement and civilian instructor certifications and has shot and taught on ranges all over the country. Bill Foster joined the Targetworx team in 2011. Bill retired from the U.S. Department of Education as a financial analyst in 2010, which culminated a lengthy career in investments and banking. A true renaissance man, Bill is adept at a wide range of skills - all the way from soddering fine electrical parts to developing financial projections, and possesses a keen eye to detail and craftsmanship.